It wasn’t until the rise of the Este dynasty in the thirteenth century that the community actually began to grow significantly. The prevailing attitude of the Estenese welcomed Jews expelled from Portugal and Spain; this resulted in an initial migration of twenty one prominent families. The Ferarese refuge was especially welcoming to those families who were perceived to be able to strengthen the economic conditions of that time. After the collapse of the Duchy Este, the climate changed and in 1627 a ghetto was created, mirroring other Italian cities during that time period. Today, Ferrara is most commonly associated with the famed novelist, Giorogio Bassini. In 1962 Bassini wrote The Garden of the Finzi Continis, later adapted for film by Victorio Di Sica. The historical, semi autobiographical novel set in the 1930’s chronicles the lives of Italian Jews in Ferrara through the advent of the Racial Laws and Fascism. Always being intrigued by Italian Jewish history, Ferrara was a must for our spring visit to Italy. Once the reservations were made, I was delighted to learn that we would be there during the annual ” Festa del Libro Ebraico Italia”, The Italian Jewish Book Festival. My research had well prepared me for this visit from a historical perspective, but I wanted more than to wander through the cobblestoned streets, while paging through a guide book. After some investigation, I located the accomplished Elisabetta Gulino, specializing in Jewish Ferrara. Our walking tour began at the Jewish Cemetery, adjacent to the Renaissance ramparts of the city of Ferrara and only steps away from our hotel. Elisabetta guided us through the shaded portion of the grounds, stopping at each memorial marker narrating the story of that family through the generations. The grave of Giorgio Bassani stands isolated in a rather deliberate way, somehow linking Ferrara’s rich Jewish past to the present. As Elisabetta referenced the fictional Finzi-Continis, one could imagine the head strong character Micol seeing her friend scaling the garden wall. Moving across the vast lawns we were transported through time. Elisabetta’s keen understanding of not only the Jewish history of Ferrara, but the essence of the city of Ferrara itself, provided us with a authentic sense of the area’s past. The tour continued in the central part of Ferrara in the shadow of the duomo. Elisabetta graciously escorted us along the Via Mazzini, location of the surviving synagogue building; unfortunately inaccessible due to the earthquake in 2012. On either side of the building facade are plaques commemorating those deported during the early 1940’s; a rather sobering moment, especially since two of the surnames were that of my mother-in-law. Several days after our tour, Elisabetta contacted us providing rather extensive information on the husband and wife who tragically met their fate at Auschwitz. We strolled through the maze of narrow streets while Elisabetta recounted the rich details of its former residents. Her knowledge of the families’ lives, traditions, architecture, & politics was astonishing. Traveling with an octogenarian, my father-in-law, there was some initial concerns regarding our ability to maintain the required pace of such a tour. Elisabetta’s thoughtful and considerate manner fostered an atmosphere which allowed us to enjoy the morning outing in a most comfortable manner. Elisabetta’s command of English is flawless, along with being conversant in Italian, French, German and Spanish. Jewish Ferrara is only one of the many tours she offers. Elisabetta also conducts excursions of the surrounding areas including Bologna, Cento, Comacchio, and the Po Delta. We look forward to our next visit when we shall join Elisabetta for a guided bicycle tour of Ferrara. Our morning with Elisabetta was instrumental in helping us establish an itinerary for the remainder of the week. 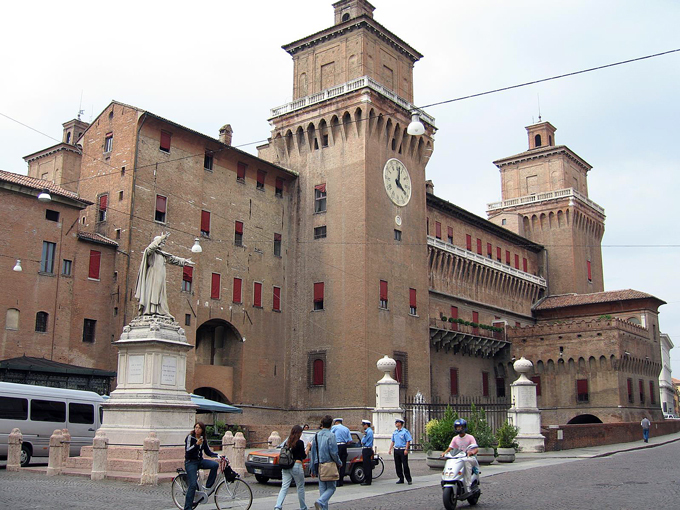 The city of Ferrara remains largely unspoilt by the tourism one associates with Florence, Venice and Rome. Although it has a definite sense of sophistications & elegance, Ferrara has a gentleness and charm which allows one to savor the Italian experience. I wish I had read this lovely post before we went to Ferrara. We tried to book a walking tour but were too late and they were all full. We’re definitely returning and hopefully we can get in touch with Elisabetta. Well, now you definitely must return! Elisabetta provided us with a well informed background to explore this charming city. Janie, it seems as though we are birds of a feather.